One of the most popular cosmetic treatments we offer here at Cosmetic & Esthetic Dentistry is porcelain veneers. This treatment can correct a wide variety of aesthetic issues with the teeth, and can be very long-lasting with proper care. Porcelain veneers are also beloved by celebrities, as they are a great way to create a beautiful and natural-looking smile. If you are looking to get that "Hollywood smile," see if you are a candidate for porcelain veneers by contacting us today. Call 781-396-8558 to schedule your consultation with Dr. Ryan Clancy, our LVI-trained cosmetic dentist. Porcelain veneers are thin shells of dental grade ceramic that are placed on the front of the teeth. These shells are translucent and mimic the appearance of natural enamel. They are stain-resistant and long-lasting, making them a great choice for someone looking to cover up minor cosmetic flaws and achieve a durable and beautiful new smile. If you have structural issues with your teeth, you may need dental crowns instead. 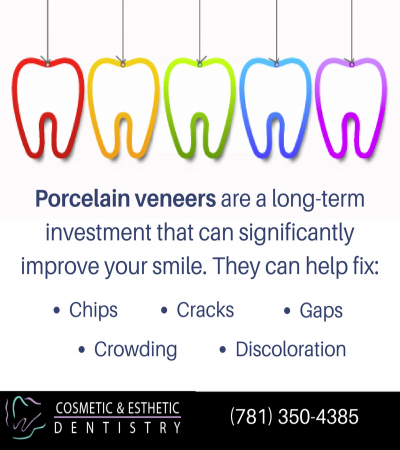 Porcelain veneers can help with very minor structural issues, but if you have significant decay or weakened teeth, a crown will probably be better. Crowns replace more of the tooth, and can take more biting force than veneers can. In some cases, patients may benefit from a combination of treatments in order to achieve best results. A customized "smile makeover" can help if you have multiple issues with your teeth that need to be addressed. Veneers are sometimes called "instant orthodontics" because they can be placed over teeth with minor misalignment, gapping, or crowding without the need for orthodontic treatment. However, if you have moderate to severe misalignment issues, you may benefit more from an orthodontic treatment such as Invisalign. Dr. Clancy will let you know your options after examining your teeth during your consultation. Veneers are also a great solution for chips and cracks. They are longer lasting than dental bonding, which is another treatment option for minor chips and cracks. If you have a single tiny chip on one of your teeth, dental bonding may be a better option as it is less expensive and can be performed in a single sitting. However, if you have a larger chip or if multiple teeth have cosmetic concerns, porcelain veneers are usually the superior option. If you have gum disease, this will need to be treated before having porcelain veneers placed. In addition, poor oral hygiene habits will need to be corrected. Porcelain veneers are not an instant fix for decay, and will not last if you don't take care of them. Neuromuscular issues such as TMJ often require more extensive treatments to correct a misaligned bite. Once your bite is corrected, though, porcelain veneers can be used to create a more aesthetically pleasing smile. If you are seeking TMJ treatment but are also interested in veneers, let Dr. Clancy know so that he can create a comprehensive functional and aesthetic treatment plan for you. Finally, porcelain veneers candidates need to realize that this treatment is irreversible and will require care. Veneers require the natural teeth to be shaved down a little bit so that the veneers can fit comfortably, and once the teeth are shaved there's no turning back. Veneers can last an incredibly long time with proper maintenance, but if they are damaged or fall off, they will need to be replaced. The placement of porcelain veneers is minimally invasive and painless. During your visit, Dr. Clancy will prepare your teeth by removing a small amount of your natural enamel. Although the veneers are wafer-thin, the removal of some enamel is necessary to ensure that they fit comfortably and seamlessly into your smile. Abrading the enamel is not painful, but we can use a local anesthetic to reduce any discomfort you may feel. We also offer the NuCalm system to help our patients relax during treatment. Once your teeth have been prepared, we will make impressions to be used in crafting your custom veneers. Dr. Clancy will work together with you to help you decide on color and shape. Although many patients want to choose the brightest shade of white, we often counsel against this, as it can look unnatural. We'll help you choose a shade that will look beautiful but still natural. It takes some time to get your custom veneers back from the lab, so in the meantime you will be fitted with temporary veneers to protect your teeth. In general, you'll need to wear the temporaries for around a week until we get your permanent veneers back. During your second appointment, we'll fit your custom veneers. You'll be able to see how they look in your mouth, and we'll make sure that they are comfortable. If there are any problems, or if you change your mind about the shade or shape once you see them in your mouth, we can send them back to the lab to make corrections. If there are no problems, Dr. Clancy will cement the permanent veneers in place, and you will leave our office with a brand-new smile. Porcelain veneers can last for decades if they are taken care of properly. If you do not practice good oral hygiene, or if you use your teeth for damaging activities such as opening packages or chewing on pencils, then you will likely have to replace one or more of your veneers within a few years. Porcelain veneers can also be damaged through accidents that result in trauma to the mouth. Dr. Clancy understands that accidents happen, which is why he offers a guarantee on his porcelain veneers work. If your veneers are damaged or fall off through no fault of your own within the first 5 years of placement, he will replace the damaged or missing veneer for free. Dr. Clancy will also give you guidelines in person regarding how best to care for your veneers. Maintaining good oral hygiene is the best way to ensure both long-lasting veneers and great oral health, so it is essential to brush, floss, and keep on top of your regular dental checkups. You should never use your teeth as tools, whether you have veneers or not. Crunching on hard candies or ice can also easily damage both natural teeth and veneers. Sticky candies such as toffee are bad for your natural teeth because they can get stuck in the crevices and cause decay, and they are bad for veneers because they can loosen the veneers and cause them to fall off over time. 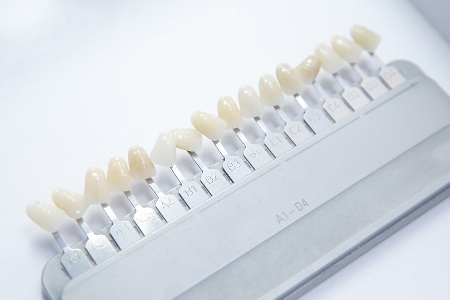 The cost of porcelain veneers will vary from patient to patient, and depends on such factors as how many veneers you need and how complex your individual case is. Costs will also rise if you need additional treatments along with your veneers. We understand that porcelain veneers can be a large upfront cost, so we offer dental financing plans for patients who would prefer to spread out the cost. Ask us about which plans we take during your consultation, and our patient coordinator will be happy to assist you in finding the right financing plan for your needs. Porcelain veneers are considered a cosmetic treatment, so they are not covered under insurance. If you are interested in porcelain veneers, don't hesitate to contact Dr. Clancy at 781-396-8558 today to schedule your consultation. We serve patients in the greater Boston area, including Winchester, Somerville, Cambridge, and Medford.